My reading tastes include many genres, and I move amongst them as the spirit moves me. While I do enjoy non-fiction (especially about chefs or cooking), I sometimes find it much “heavier” to read than fiction. It often takes me longer to get through a non-fiction book.Sometimes, though, I will stumble across a narrative non-fiction title - non-fiction that reads just like fiction. These books are fun finds because they combine the topics of non-fiction with the easy reading of fiction. Welcome to Utopia is one such book that falls into this category. Beginning in 2006, Karen Valby, a senior writer for Entertainment Weekly, found Utopia, Texas for an article about popular culture deserts. 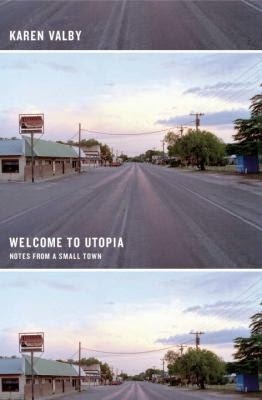 Utopia is a small town (population 241) an hour away from the closest city and barely touched by the influence of pop culture. She was so intrigued by the town that after completing the article she returned to learn more about four specific residents. Their stories are this book. The featured Utopians are different ages, races, and genders and, most intriguingly, have different feelings about life in Utopia. Anyone who has ever complained their hometown had nothing to do will think twice after learning about this place! Thanks to Valby’s writing style it is easy to get pulled into the four stories told in alternating chapters. One forgets that it is non-fiction and that these people and their lives and their town are all real.